I would like to introduce myself as C.K. RAMAMURTHY. 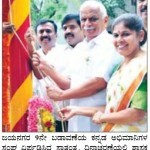 Corporator, Bruhath Bangalore Mahanagara Palike, Pattabhiramangar Ward-168. I am serving as a honest and active member of Bharatiya Janatha Party from the day I joined, And also in various other organizations. Bharatiya Janata Party is on a mission to turnaround this country but things will not change without you.